US State Department says it’s moving ahead with planned Trump-Kim meeting in Singapore in June despite North’s warning. 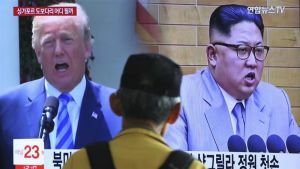 North Korea’s official Korean Central News Agency (KCNA) also cast doubt on whether next month’s summit between North Korean leader Kim Jong-unand US President Donald Trump would go ahead as planned, South Korea’s Yonhap news agency reported. “This exercise, targeting us, which is being carried out across South Korea, is a flagrant challenge to the Panmunjom Declaration and an intentional military provocation running counter to the positive political development on the Korean Peninsula,” Yonhap quoted KCNA as saying.